Greek yogurt chicken salad is amazingly delicious. 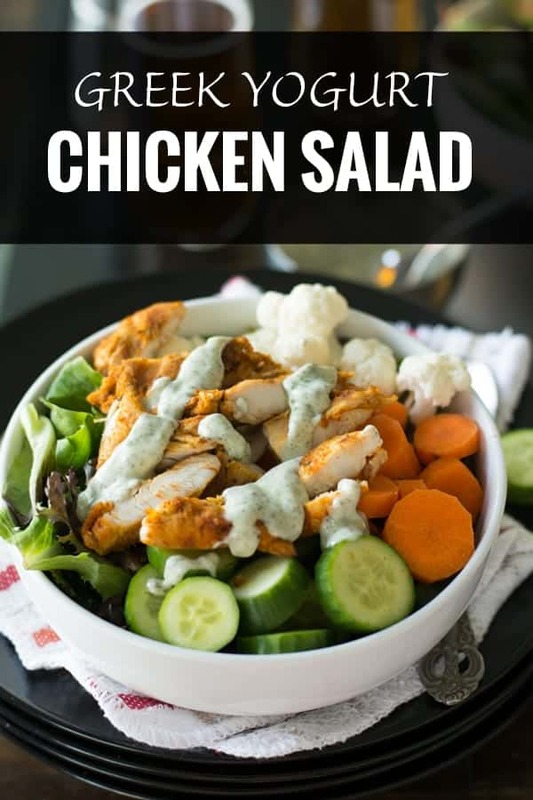 Made with spicy chicken, crunchy vegetables and mint flavored dressing. This is healthy, Paleo, Keto and also an easy to make potluck recipe. This salad can be served as side dish or as an appetizer. This super healthy summer salad is great to have as low carb meal which gives full feeling for a longer time. If you’re looking to switch up low carb skinny diet, then this salad is for you. Or if you are looking for something very delicious and effortless. 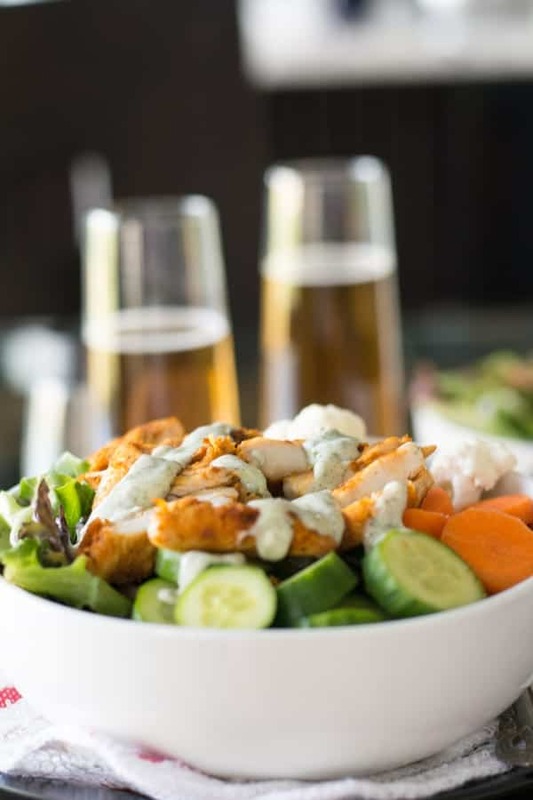 I’m telling you, you are going to love this Greek yogurt chicken salad with the mint dressing. How does this salad tastes? The dressing of the salad tastes lightly tangy and mildly mint flavored and creamy. The chicken bites are spicy. 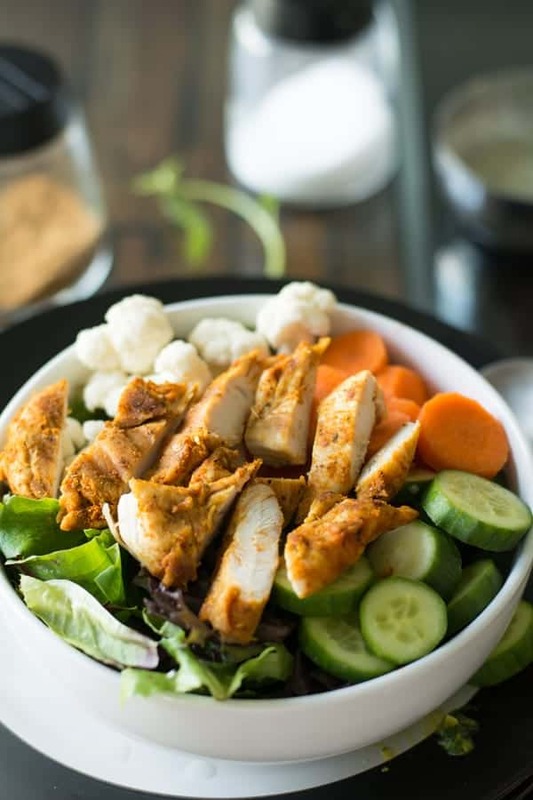 Healthy Greek yogurt chicken salad is beautifully balanced between all these tastes. The heat of the chicken compliments the creaminess of the dressing. Why Greek Yogurt for the dressing? Chicken salad with Greek yogurt instead of mayo? of course Mayo always great with the salad. But what would be the healthy substitution for mayo? no further thinking, the absolute winner is none other than Greek yogurt. This Greek yogurt chicken Salad an attempt to make the mayo free Greek yogurt chicken salad and skinny. But without compromising on the taste or texture. The summer is still here my grocery stores are loaded with greens and garden fresh vegetables. And this skinny salad is going to be my complete meal. Greek yogurt has a creamy taste and texture. And the creamy dressing perfectly compliments with the crunchy vegetables and the chicken. This salad is delicious with a beautiful blend of spiciness and the creaminess. I’m sure you’re going to love this Greek yogurt chicken salad for sure. If you are looking for other skinny salad recipes, you may love these recipes as well. For me, summer and winter months are weight gaining months. Because of no work outs and lots of holiday foods(I literally have lot of food, felt lazy enough to go for working out). This is my personal experience, this happens for every year. Every peak summer and winter I always gains few extra pounds. But the spring and fall are realization time, where I worry about my weight gain. And will start working towards it. I gained few extra pounds as usual. Naturally, this time also I’m blaming the vacation and the travel. But that’s not the truth, it is all happens because of the love I have for food. What next? it is the time for me to put myself on dieting on the skinny side like this no fruit Greek yogurt chicken salad. To say in quotes a “healthy dieting”. I’m not going to starve or put me on to any type of specific diet plans. I’m just going to reduce carbohydrates and the fat in menus. This is my personal opinion and I’m not a dietitian or nutritionist. I’m going with what my body says to me. And that is it, it may take time to achieve my target. But it is okay for me, as all I wanted to reduce is 4 pounds. If you want you may add croutons. Serve with the dinner roll to make it a wholesome dish. You may add ¼ teaspoon of cumin powder to the dressing. Add in roasted peanuts or roasted almonds or roasted chickpea for healthy carbohydrates. Add in crushed cilantro or coriander leaves to the Greek yogurt mixture. Try adding curry powder or garam masala powder to make the chicken spicy and more flavorful. You may make chicken salad with yogurt and sour cream. Add half the quantity of Greek yogurt and sour cream. Along with vegetables you may add Grapes, cranberries or apple. 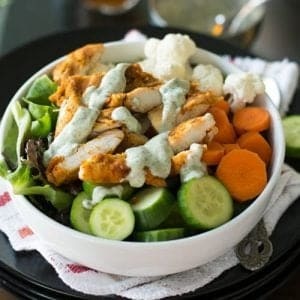 These ingredients gives other dimension to this Greek yogurt chicken salad. Instead of adding fresh mint leaves you may also add crushed fresh dill. This variation will tastes great. You may also add cooked quinoa, barley, wild rice to make it wholesome food. This salad is a low carb salad. So, pairing it with dinner rolls, or rice, pasta would be great. Homemade apple juice would be a great combo. You can make ahead the chicken a day before. Today, I made the salad with the yesterday’s leftover chicken. You may wash and rinse the vegetables before the day. But I would suggest to chop them just before serving. Chopping and serving immediately will avoid any unnecessary nutrient losses. Greek yogurt sauce can be made in advance. For this whisk Greek yogurt with crushed fresh mint leaves and salt. Then transfer it to a airtight container. And store it in the refrigerator. Add in to the salad just before serving. 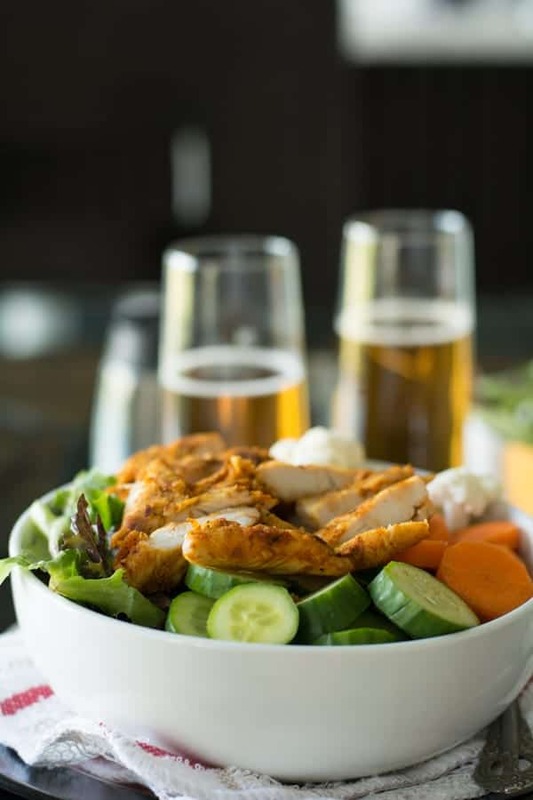 Greek yogurt chicken salad is made with the commonly available pantry ingredients. Most of them you may be having already or you can find these easily in any regular grocery stores. Greek yogurt you find this on the dairy isles in the grocery store. They will be kept along with the yogurt. And make sure you are getting plain Greek yogurt. The dressing is more delicious when made with plain yogurt. Breast or the tenderloins portions are great for the salad. But may also make with thigh portions. Any fresh crisp vegetables are great to add. Cucumbers,broccoli, cabbage, carrot, onion. Greek yogurt chicken salad is best as an appetizer or side dish. 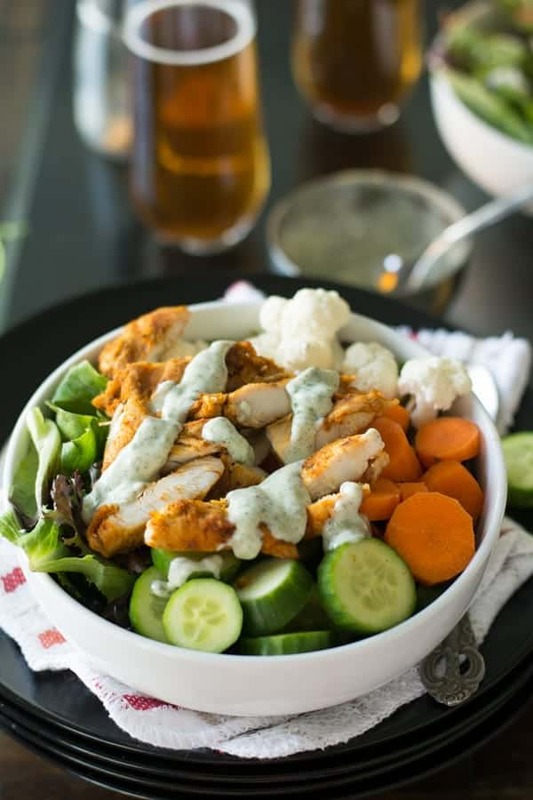 This chicken salad with Greek yogurt dressing gives full feeling for a longer time. In a mixing bowl add chicken paprika, cayenne pepper, salt and lemon juice. Combine and allow it to marinate for 30 minutes. Then cook it until both the sides cooked evenly. Slice them into bite size pieces. In a small mixing bowl, add Greek yogurt, minced mint leaves and salt. Whisk well until it reaches a smooth and creamy consistency and keep aside. Wash and rinse all the vegetables and chop them. In a mixing bowl, add all the chopped vegetables. Then add chicken. Then add the Greek yogurt dressing. Serve immediately. Suja, I’m always looking for ways to trim down this food blogger’s belly, so this works fine for me. I love the yogurt dressing. I may may some of the dressing for my roasted cauliflower I’m planning.